Human-like robots with soft bodies that can care for older adults in hospitals and nursing homes may sound like the stuff of science fiction, but soft-formed, caregiving robots created through 3D printing technology could be right around the corner. And the technology may become mainstream just in time to care for an ever-growing population of adults ages 60+, which is expected to double by 2050. But the external hard structure of today’s robots limits their capabilities. Recent advances in material science, however, have enabled the fabrication of robots with deformable bodies or the ability to reshape when touched. 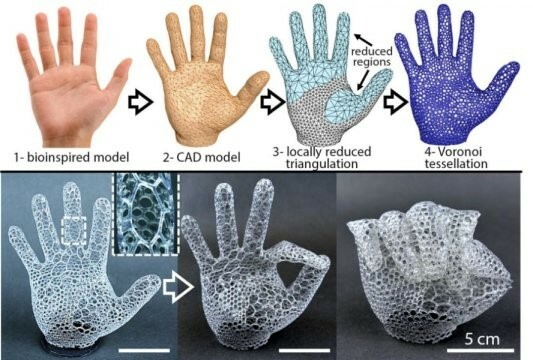 And now, researchers at Purdue University have developed a new design method that shows promise in enabling the efficient fabrication of soft robots using a 3D printer, which could lead to eventual commercialization of the technology. These architected soft machines (ASMs) can perform complex motions, such as gripping or crawling with ease and represents another step in the development of autonomous and lightweight soft robots able to offer caregiving and disaster response services.